It is almost a month now since my mom died and I am still having a hard time with coping. Like one of my friends on facebook said, there's no one in your corner like your mom. But...it certainly helps lift my spirits to know that you all care about me and are supportive of me. Thank you so much. The below polish was gifted to me anonymously. I posted it on my facebook page and no one fessed up! So to whoever you are, my most sincere thank you. It brightened my day to receive it, and now that I'm painting again, I put it on last night and have enjoyed it all day today. It's a stunningly beautiful polish! I don't think I've ever worn anything quite like it. 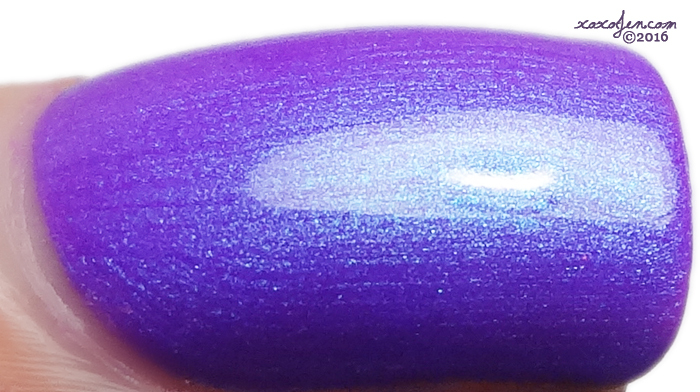 The blue shimmer comes through so strongly and the shade of violet in the base couldn't be more perfect. I'm wearing just two coats in the photos below. This is my first Tonic Nail Polish, and likely won't be my last! Isn't it though? It's as if there was a magical fairy who knows me really well and chose it to send to me. You wouldn't happen to know her would you?